KEN’S PIECE WAS VERY WELL RECEIVED AND I AM SURE THIS ONE FROM DOUG & HELEN WHITE WILL TOO. We have just finished a wonderful holiday in Malaysia. Except for a few things, like the toilets and the drivers, it was great. The people are friendly and helpful. The food is quite exciting and the country is spectacular. There was one incident, which caused us no concern and no problem, but left us more than a little baffled. We were in the Chow Kit area buying some things to take home when we found some shirts with “BERSIH 2” on them. We asked the man what the word meant and he said “clean”. So, we bought some. They were good quality and cheap. As we were leaving the stall area we were approached by a man who warned us not to wear the shirts or we would be in trouble with the police. We went back to our hotel thinking that we misheard the man at the stall who sold us the shirts and that bersih must be a very dirty word. So we asked the concierge and he told us it meant “clean”. So we were confused. At dinner that night, we struck up a conversation with the people at the next table. We raised the matter with them. They told us the shirts represented a call to the people and Government for clean and fair elections. They also told us that people wearing the shirts are being locked up without trial for waging war against the King. They explained that the Government and some people were against free and fair elections. Fair enough, it is not our country. What we still do not understand is why the King would be against free and fair elections because he is not elected. Our friends warned us that even talking about free and fair elections could land us in gaol. Perhaps the government could put signs at the airport warning travellers that bersih is a dirty word in Malaysia and that the King and Government are against free and fair elections. In this way, no one will make a mistake that could land them in trouble. People's hopes are modest. No matter what race, region, religion and class we come from, most of us believe that every child should have a genuinely good education. And those children should be able to go to college even if their parents aren't rich. We want to be safe from criminals. We want the assurance that the taxes we pay are spent well. We want clean air, clean water, and the ability to retire comfortably at some point. And although we don't expect our government to solve all our problems, and we certainly don't like seeing our tax dollars wasted, it's only fair to expect that government should help. We're all sick of the dead zone that Malaysian politics has become - where backbiting and character attacks have become part of our daily news routine. 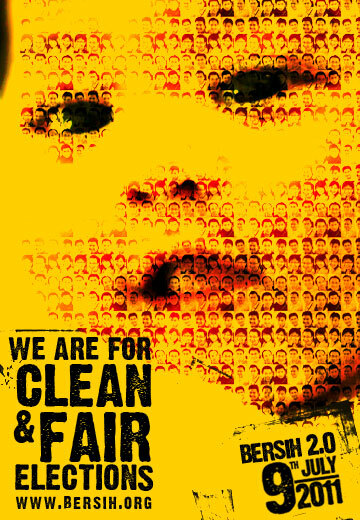 We're all aware that the nation's most significant challenges are being ignored. Everyone talks about reforms and transformation and plans and programmes and manifestos. But how much of that are we really seeing? Let's face it. We all talk about it. We've all played the armchair critic role at some point or another. Any of us can and have pointed out the flaws so apparent in our government. We all talk. Ask anyone on the street what they've done about the situation our nation is facing lately and chances are you'll get a blank stare. But walk into a coffee shop and suddenly you're surrounded by veteran politicians discoursing the latest injustice/scandal/expose etc. Maybe the time for talk has passed. As the saying goes, talk is cheap. I believe the first step towards changing the face of Malaysian politics/government is getting involved, simply by registering to vote and exercising that right to vote. I wonder how many skeptics out there have decided to forgo that right simply because "my 1 vote won't make a difference". True, in Malaysia you can win 90% of the seats with 60% of the votes, but that only serves to emphasise the importance of each vote. We need to be absolutely clear about one thing - transformation can never be birthed of apathy. The next step is reinforcing the need for free and fair elections. Does the fact that 30,000 people walking someplace change anything? Not explicitly perhaps. But it inspires defiance against a broken system, engenders a willingness to stand up for change and above all, represents the audacity to hope and to believe that our nation can be transformed. I didn't give 2 cents about Malaysia or its politics before 2008. But seeing the first Bersih rally on TV in 2008 awoke something in me. I realised for the first time that I could not leave it to someone else to fight my battles for my nation on my behalf. For the first time, I dared to believe that things could change. I'm not writing this to ask anyone to join the rally. It's risky business indeed, what with the prospect of getting water cannon-ed, tear gas-ed or if you're extremely unlucky, arrested. I write this because I feel it's my duty and obligation to speak out as a young person to say we all have to care enough and believe that change is possible when we exercise our votes and EC is playing fair. 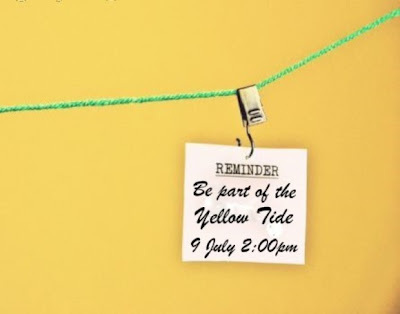 Wear yellow on July 9 to show that you care. Do you remember how we used to be taught in school that the young people are the future of the nation? Well, we can only be that if we care enough. Civil Resistance is an inherent democratic process. there must be UNITY, PLANNING and NON-VIOLENT DISCIPLINE. No authoritarian regime can hold power long if their security forces shift their loyalties. THIS IS ABSURD, COCKEYED, DERISORY, IDIOTIC, LAUGHABLE, LUDICROUS, NONSENSICAL, PREPOSTEROUS, FARCICAL BESIDES BEING RIDICULOUS. Penang deputy police chief Abdul Rahim Jaafar today said the 30 Parti Sosialis Malaysia (PSM) activists arrested yesterday while aboard a bus at the Sungai Dua toll plaza have been investigated under Section 122 of the Penal Code for the charge of waging war against the King. "The leaders have warned the rulers many times about ethics and told them that they could not continue doing certain things. It is not necessary to talk further. We have talked with the rulers many times before and it is now time for action." – Nazri Aziz, Umno Youth deputy and senator in New Straits Times, Dec 29, 1992. "If rulers interfere in politics and it is proven, we want the Parliament to declare the election is illegal and cancelled. In business, if rulers’ involvement is proven, we should assume the business is illegal." – Nazri Aziz, Umno executive council member in Utusan Malaysia, Dec 3, 1990. "I would like to ask, how insulted do you feel when the Sultan of Kelantan does not invite our menteri besar to give a speech on behalf of the people each time His Majesty celebrates his coronation day whereas the people had chosen the menteri besar through their rights." - Nazri Aziz, Umno Youth Exco in Utusan Malaysia, Nov, 30, 1990. "A ruler will enjoy the respect of his people even without the immunity but with the conduct that is appropriate with his office. 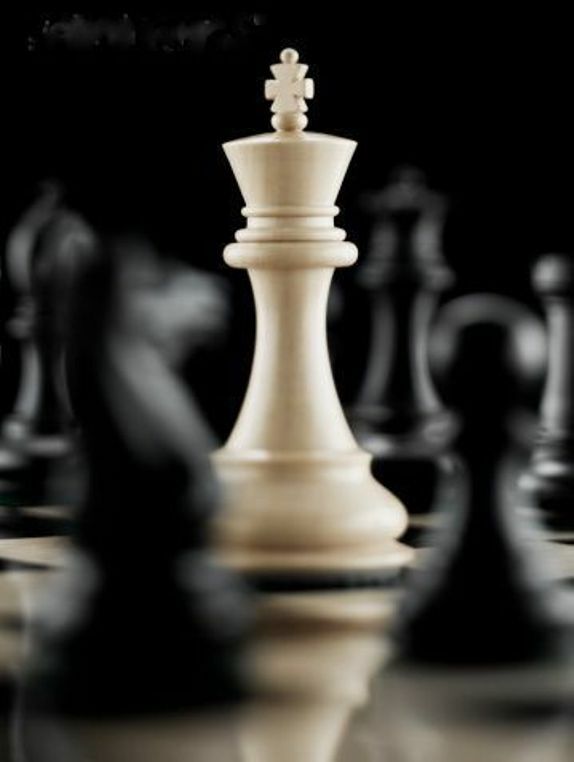 Though the issue is a bitter pill to swallow, our rulers must accept the fact that immunity is not God given." – Muhyiddin Yassin, Johor Menteri Besar, New Straits Times, Dec 27, 1992. "A great idea or change cannot be stopped even by a battalion when its time has come. If he loves the throne he will make sacrifices to make the subjects happy." – Sanusi Junid, Agriculture Minister, New Straits Times, Dec 23, 1992. "As the country’s highest legislative body, any subject is allowed to be discussed and concluded in the Dewan Rakyat, including matters pertaining to the rulers." - Zahir Ismail, Dewan Rakyat speaker in New Straits Times, Dec 15, 1992. "If this race was not sovereign, don’t expect the sovereignty of rulers." – Saharudin Hashim, Negri Sembilan Umno delegate, Mingguan Malaysia, Dec 2, 1990. I hope the Royal Houses will remember these statements from UMNO when they make their speeches and 'royal decrees' in future. Me? I only get inspired by the right stuff, even if it comes from an ordinary Malaysian. Meantime, you might be turnoff (opposite of inspire) by THIS. THE OUTING OF ANAS ZUBEDY. Commander (Rtd) S. Thayaparan, Royal Malaysian Navy, is a regular kopi-tiam kaki of mine. He graduated from the Britannia Royal Naval College, Dartmouth in 1965. His tour of duty saw him as Commanding Officer of KD Tombak, KD Gempita, KD Ganyang and Executive Officer on Training Frigate KD Hang Tuah. Through self-study he qualified to read law at Lincoln’s Inn and was the first Malaysian Naval Officer to be called to the Malaysian Bar in 1985. Commander Thaya was the prosecutor for the Navy in the case of the collision between K.D. RAJA JARUM and M.V. SHOUMARU, and acted as Defense Counsel in the case of the sinking off the petrol vessel K.D. SRI PERAK in the South China Sea, both making front-page news. 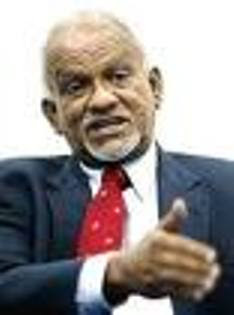 Since retiring from the Navy, his expertise were sought in Timor Leste supervising both Parliament and Presidential elections and as a UN Volunteer Sri Lanka. He is currently with Yayasan Salam, an NGO. Without an iota of doubt, make it clear that you completely accept history that this country is sired from a Malay polity; with a history, religion and way of life that are from the Malay-Islamic tradition. Only when you make it very clear that you acknowledge this history, communication lines will begin to open. 1. Firstly, who do you mean by “we”? We as a nation? We as a culture? Who comprises this “we”? We are a diverse group of people seeking shelter in a country not our own. The only people who can legitatemely say they are “natives” are the Orang Asli and the indigenous people of Sabah and Sarawak. Perhaps it is you who should acknowledge that before the arrival of Islam, “you” were Hindus. Perhaps it is “you” who should acknowledge that your culture contains aspects from both Chinese and Indian Culture. Perhaps this should be acknowledged in our history books and taught to our young. Perhaps when you acknowledge this like many other Malays, you would be able to empathize with the rest of us who acknowledge the polyglot nature of our culture. Just ask the Baba Chinese or the Chittys of Malacca. I assure you when you acknowledge this; you will find communication much easier. Generally, the Malays are a gracious people. They are more inclined towards giving than taking. They showed this when they agreed to share Tanah Melayu. They see it as a sacrifice. You must learn to understand why they feel that way. 2. I appreciate that the indigenous people shared their land…….Not that they had much choice in the matter. I think grace is shared by most people in this country. I suggest you read up on how the Malay rulers negotiated this “giving” of Malay land. I suggest you educate yourself on who helped build the infrastructure of this Malay land. I hope some day you understand the sacrifice of the Non-Malays who contributed in a very significant way during and before the coming of the British to this land you seem to think the Malays shared with us. Who has disrespected Malay rulers and denigrated Islam. Who has curtailed the powers of the Sultans? Who has made a mockery of the great religion which is Islam? Yes we are different communities living under the umbrella of certain principles , the most important of which you mentioned but the fact is, it is UMNO and UMNO alone who is responsible for the lessening of power of the Sultans and the injudicious way Islam is applied. Anyone who becomes a citizen is expected to follow the laws of the land. The non Malays have honored this. I suggest you look to UMNO who claim they represent the Malays who have usurped the powers of the Sultan and denigrated Islam. Why should the DAP thank the Malays? And by Malays I mean people like you. Perhaps it is people like you who should thank the non-Malays. Who pays more taxes? Money that goes into education institutions that benefit the majority of Malays. Money that goes into religious organizations that morally police the Malays. Money that goes into institutions that denigrate other races – BTN for instance. Perhaps it is people like you who should be thanking the Non Malays. We are a simple people and I am sure we would receive your appreciation with open arms. their idiosyncrasies, just like there are idiosyncrasies in any other culture. 3. I think Mr. Guan Eng knows the Malays pretty well. After all he was detained under the ISA for defending a Malay girl while the Malay Menteri Besar who assaulted her got away scott free. So, really it is you who need to know Mr. Guan and the rest of the DAP better. It is you who need to understand that Mr. Guan Eng and the DAP already know the Malays. Mr. Guan Eng for instance probably got to know more about Malay culture when he was detained under the ISA with Mat Sabu his PAS comrade. I have no idea what you mean by getting to know the Malay community. As a people we understand each others community. The DAP is merely a political party and not some sort of stand in for the Chinese community. If the DAP really wants to represent all Malaysians, regardless of race and religion, you need to understand all Malaysians. And the Malays need to know that you understand them. Fifty-four years after agreeing to become a community among communities, they are naturally concerned that those in authority are people who will not understand their needs. Of course the DAP wants to represent all Malaysian. This is why their political principles are based on certain basic commonalities that all communities can subscribe to. Of course the Malays understand the DAP especially now that the DAP is forging closer ties with PAS. They understand better now because the blindfold is slowly but surely being lifted of their eyes. They see that both DAP and PAS are working together for the benefit of all people and that all people of this country are equal and should be treated as such. The Malays realize that people in authority have used race for years to divide this country while enriching themselves and exploiting their gracious nature. hearts of the Malays. Another simple thing to cultivate is the habit of wearing traditional Malay wear, especially during official functions. Perhaps you can also organise programmes for your leaders to stay in a Malay kamping. It will be a good eye-opener for them to understand how to relateto the Malays. I have no idea what you mean by Malay adat and peribahasa. Exactly what has this got do to with understanding Malay culture? Does Mr. Guan Eng speak Malay? Yes he does. Is the manner in which he speaks it rude? No it isn’t. Does Mr. Guan respect the Malay community? Has he allocated funds and resources to help the community? Yes he has. In short, has he run the state he leads competently? What is wearing Malay traditional dress really mean? What is staying in a Malay kampong achieve? If people are in need regardless of race, an effective leader carries out programmes that benefit them. Your mundane suggestions make it seem as though Mr. Guan Eng is an alien, who has no clue of Malay culture when he has lived here all his life. Perhaps it is people like you who should wear the traditional dress of Non-Malays then maybe you would not feel as though non Malays don’t understand you. that you respect and value Malay culture. It will demonstrate the DAP's inclusiveness. A good example of inclusive culture is shown in the Peranakan community who draw from both Malay and Chinese traditions. By being inclusive, they do not lose out anything but become a richer people for it. Practicing simple gestures like you describe is nothing but symbolic gestures meant to distract from the real problem of the community. I would rather Mr. Guan Eng concentrate on the numerous social problem that affects the Malay community and by helping remedy such problems, Malays (like you) will realize that substance is far more productive than form. in the Malay culture. The Chinese may see saying sorry as "losing face" but for the Malays, saying sorry it is to give the other party "face" - an act of high culture. 4. What does the DAP need to apologize for? Please list out the wrongdoings that the DAP has perpetuated against the Malay community. Why is the Malay community feelings hurt? What exactly has the DAP done? Please be specific, because simply asking for an unwarranted apology is the height of hubris and exactly the sense of entitlement that the policies of UMNO have created. But seeing how Malays like you, like to say sorry, perhaps you could apologize for Ibrahim Ali, for waving the Keris around, for the systemic discrimination that the Non Malays have to put up with, the constant reminders that we are foreigners even though as I have stated above it is our taxes that are being used for the majority. example, the DAP's attempt to forge a "Malaysian Malaysia" in the way of making the Malay culture and all cultures of Malaysia equal. That is wrong to our history. They are inconsistent with the DAP's objectives as an inclusive Malaysian party. Right, now we get to the crux of the matter. You do not think that non Malay culture is equal to Malay culture. Behind your benign rhetoric is really a supremacist, wanting his due. Yes, we are all equal. In other words, you probably are a firm believer in Ketuanan Melayu. I trust you realize that PAS has abandoned that perspective. Thankfully most Malays are not like you. When you finally ever read Malaysian history you will be disappointed to discover that what you think of as Malay has got a lot to with non Malay cultures. I hope the DAP never bows down to the supremacy you subscibe. I hope no party ever bows down to your racist and bigoted views. Once you say sorry, it will not be difficult for the Malays to forgive and to forget. It is part of the Islamic principles that are ingrained in the Malay worldview. Prophet Muhammad also showed the example of a forgiving spirit. The Quran in 8:61 commands: "But if they incline to peace, you also incline to it, and (put your) trust in God." It amazes me that you advocate Malay supremacy and yet quote the Quran, which is one of the more egalitarian religious books around. I suppose you are Malay first then a Muslim, which is funny because most of the Muslim I know would say that all men are equal before God regardless of race or culture. I repeat unless you have some specific list of wrongs doings done by the DAP; there is nothing really to talk about. If the DAP is serious about being a multiracial party, it needs to re-brand public perception towards it. There must be fresh leadership so that the DAP is no longer judged based on past actions. The old must make way for the young. 5. Lim Kit Siang must not retire. Again, you are the few who wish to perpetuate this old canard that the DAP is a chauvinistic party. It is not. What the DAP is has a lot to with Mr. Kit Siang. His principles and integrity are vital if the DAP is to navigate this new terrain we find ourselves in. As long as Lim Kit Siang remains in power directly or indirectly, I feel that the DAP will continue to be perceived as a Chinese-exclusive party. Detractors will use his past actions as a scapegoat to disrupt the DAP's multiracial aims. This is why I believe that it is good time for Lim Kit Siang to pass the baton to new leaders. What has Mr. Kit Siang’s leaving got to do with rebranding? The party is rebranding itself with it’s commitment to PAS and the Pakatan Rakyat. They need experienced leaders to offer guidance in these troubled times. I have no idea why you would signal out Mr. Kit Siang and offer no reason for why he should leave except for vague accusations of chauvinism. You do not have to worry. The only reason why the DAP is perceived to be a Chinese based party is because Utusan Meklayu continues in it’s scurrilous campaign to convince it’s declining readership that the DAP is to be feared, much like how the BN propaganda organs attempted to do so with PAS. Mr. Kit Siang has got nothing to do with it. I am glad that in terms of theory and constitution, the DAP welcomes all as equal members regardless of race and religion. But to really have this in practice, the DAP has to be prepared to lose out the portion of the Chinese voter base who wishes to remain exclusive. The DAP can be a positive alternative to race-based political parties. To do this you need to let it be known that the DAP is serious about being inclusive to all. Make it clear to the rakyat that you are willing to give up ties with the chauvinistic Chinese, and all Malaysians will feel assured that you will fairly represent all. 6. Again, with the fallacious reasoning. The fortunes of the DAP have risen and fallen because of their association with PAS. One of the reasons they didn’t do well before 2008 was because of their association with PAS. It was PAS who decided to be more inclusive in terms of its principles which is why both the DAP and PAS have benefited. Exactly who are these chauvinistic Chinese you keep referring to? And what ties have the DAP, got to cut? It is you who are going on about the superiorty of the Malay race and although I do not speak for the DAP; they have no need for your vote. What they do need is the Malay voter who understands that we are all equal and that change is needed for the stewardship of this country. And thanks to the efforts of PAS many more Malays are beginning to realize that the DAP is not a chauvinistic party. The fastest way for the DAP to be a formidable alternative to race-based politics is to merge with PKR. Once you do that, automatically you become a multiracial body - a truly Malaysian party. Let us be honest with ourselves. The loose coalition of the DAP, PKR and PAS seems similar to the BN formula of Umno, the MCA and MIC. Before long, the rakyat will begin to see you as a copy of BN. The real issue that needs to be solved here is trust among leaders. When it comes to the membership, the majority will follow the leaders. If you and the DAP leadership make a clear stand to merge with PKR, the majority will follow suit. 7. Why should the DAP merge with PKR. What don’t they merge with Pas? The BN is a coalition of single race based parties. The Pakatan is a coalition of two multiracial parties and one religious one, who have shown that they can attract votes from across the board. The only one who seems to think otherwise is people like you. I think your idea of merging the parties is pure nonsense. What Pakatan has got going for it is a diversity of views. You can keep screaming about how you think that DAP is not multiracial when what you obviously mean by multiracial is that it needs to be dominated by Malays. That’s not multiracial that’s your supremacist attitude peeking out. As it is, there are Malays who would vote for DAP and their number is growing everyday as they are Chinese who would vote for Pas. Your idea of a merger while it seems like a nod to multiculturalism is rather about your race insecurities. Lastly, I felt compelled to respond to your Open letter because it caused great concern amongst the retired Malay Armed Forces personnel I mix with. Has it come to this? They wondered. 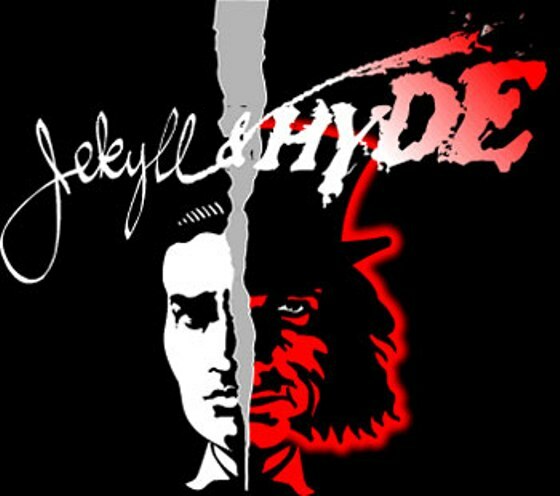 PSEUDO, BOGUS, CHARLATAN OR SOUL OUT? On Friday 28May 2010, just a year ago, I posted at 2:36am on ANAS ZUBEDY (HERE). I beatified him as a Towering Malaysian, a term that was then the flavor of the times. albert308 and friends....before I moderated your comments this is what I received on the email at 2:14PM: "Sir, were you really trying some reverse psy? Were you trying to draw out something from readers who can read deeper into Anas' modus operandi? You are fishing! Are you re-coloring him? I remember how you used to draw us into discussions in your History sessions that unveiled hidden facts that came to pass.I remember with fondness your quote: "History is not what is written. It is what happened.” Lets find out what happened and might have happened." Sir,you might get an insight presently....just be patient." IS THERE A MR HYDE IN ANAS ZUBEDY? This year's Award for Courage in Editorial Cartooning will be presented on July 7, 2011 at the annual convention of the Association of American Editorial Cartoonists taking place in St. Petersburg, Florida. The venue will be the Hilton Bayfront Hotel. This year's winner is Malaysian cartoonist "Zunar". 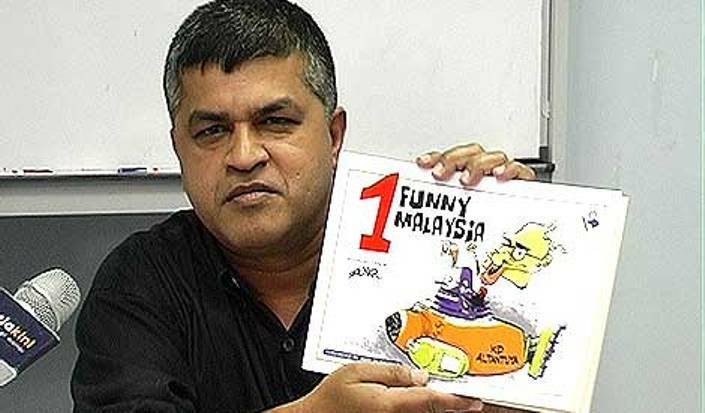 Zunar has become famous for his biting and amusing cartoons putting a harsh spotlight on the powerful political leaders in Malaysia. He has not hesitated as well, from poking fun at their families, especially those who are using their connections to empower and enrich themselves. 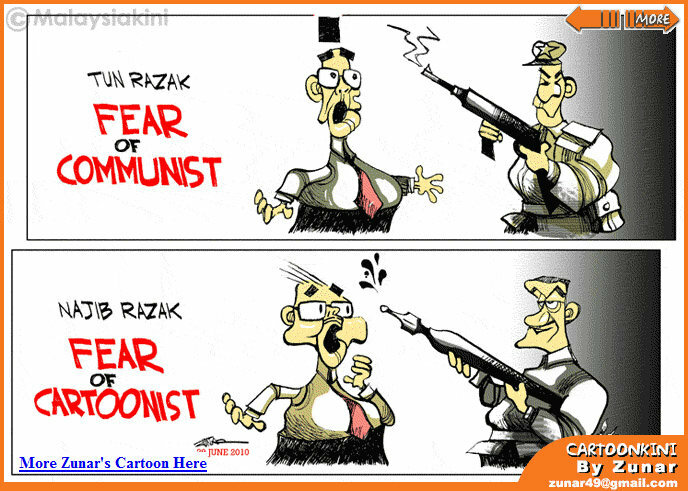 The regime in Malaysia have seized a number of his cartoons compilations and in fact arrested him last year and held him for two days in jail. When he asked his jailers, if they had read his cartoon books he received a negative answer. He asked the judge if he had read his cartoon books? The judge too said, “ No.” Soon he was released from jail. When no one could identify exactly who brought the charges against him in June of 2011, Zunar brought a civil suit against the government for false imprisonment. Zunar and his wife will travel to St. Petersburg where they will accept his award. They will also spend a few days in Washington, DC making the rounds with the media. While in the Washington area they will be hosted by Robert Russell, the director of CRN and CRN Deputy Director Drew Rougier-Chapman will see to all of their logistical appointments. 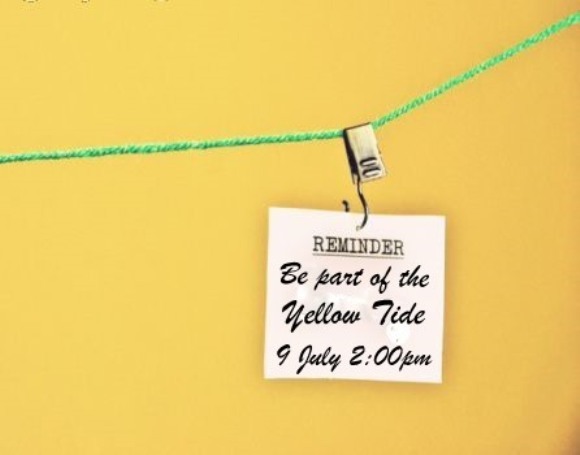 TURUN PADANG FOR THE BERSIH FESTIVAL? Bring out our drums, our wind instruments, our dancers. WILL THE CHINESE STAY AWAY FROM BERSIH2.0? My preliminary reading is they will. The Chinese will stay at home (or they will go shopping). Like any other big demonstrations in Kuala Lumpur since the 1998 “Reformasi Movement” the Chinese will stay at home despite Kuala Lumpur City being predominantly populated by the Chinese. I can say this rather authoritatively because I have participated in almost all of these demonstrations. I am the actual witness and I saw clearly with my own eyes the ethnic composition of the participants of these demonstrations. I too have participated in all the big ones since the Kesas Highway Reformasi demonstration that nearly cost me my job because an UMNO guy reported me to the MD. I wrote about his earlier and will not repeat it as it had a happy ending with my MD inclined finally to my conviction. However, of late the number of Chinese participating have increased but by my standards when compared to the other ethnic groups, still pathetic. The first demo that I participated in was during the nationwide National Union of Teachers (NUT) Strike in 1967 which succeeded in bringing about equal pay for women, as well as pension, housing and health benefits for all teachers. We took to the streets, but here again the participation from the Chinese teachers was not encouraging. On our way to Ipoh that night when Perak MB Nizar was told to vacate the MB residence I made a wager with RPK that although Nizar had endeared himself to the Perak Chinese THEY would not turn out to support him. I lost the wager when I saw the crowd in the residence. I was embarrassingly surprised at the turnout. WAS IT TO SYMPATHISE, that brought them out that night? On May 7 2009 at the Perak Assembly of the 65 of us arrested the majority were Chinese. DID THEY COME OUT BECAUSE THEY WERE ROBBED OF THEIR VOTES FOR NIZAR? MAYBE THE CHINESE IN KUANTAN ARE DIFFERENT FROM THE CHINESE IN SELANGOR AND KUALA LUMPUR…..Is there? But I say this again……the Chinese presence on 9 July 2011 will be negligible and insingnificant……probably token. PROVE ME WRONG! BUT LET ME TAKE THIS OPPORTUNITY TO THANK THOSE CHINESE WHO HAVE ALREADY MADE UP THEIR MINDS THAT THEY WILL TURUN PADANG! WHAT MI AND MALAYSIAKINI DID NOT REPORT…..
THURSDAY TRIVIA FROM OLD FART. THIS AIN'T A TUESDAY TRIVIA! 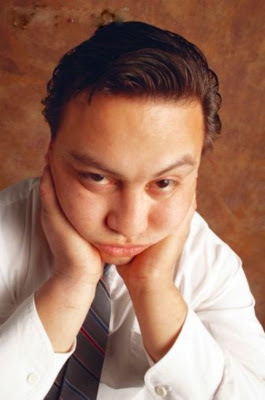 IT’S OK THE BRAIN DRAIN…. 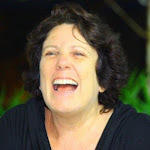 FRIDAY GUEST BLOGGER: PLANET OF THE MONYET. 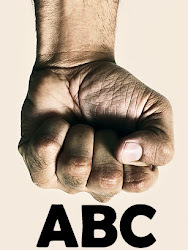 ITS AS SIMPLE AS ABC! WE ARE ROBBED, BUT THE ROBBERS WON’T TELL HOW. ADOI! IS THIS HOW SOI LEK APPLIED LESSONS LEARNT? WILL THIS BE IEAE'S PARTING GIFT TO KUANTAN? LET'S GET DOWN TO THIS. ARE WE IN SELF-DESTRUCT MODE?